If you’ve read about real estate in the past year, it’s likely you’ve read that the mortgage rates are very low. You also probably read that there is an expectation that the rates will increase very soon. Since mortgage rates are so low right now, buyers are able to afford more expensive homes. If mortgage rates increase over the fall and winter months while you’re waiting for the spring market, it could cost you thousands of dollars as it could eliminate many buyers from the real estate marketplace! Less demand for your home will mean less money. Bottom line: take advantage of selling your home while the rates are this low. 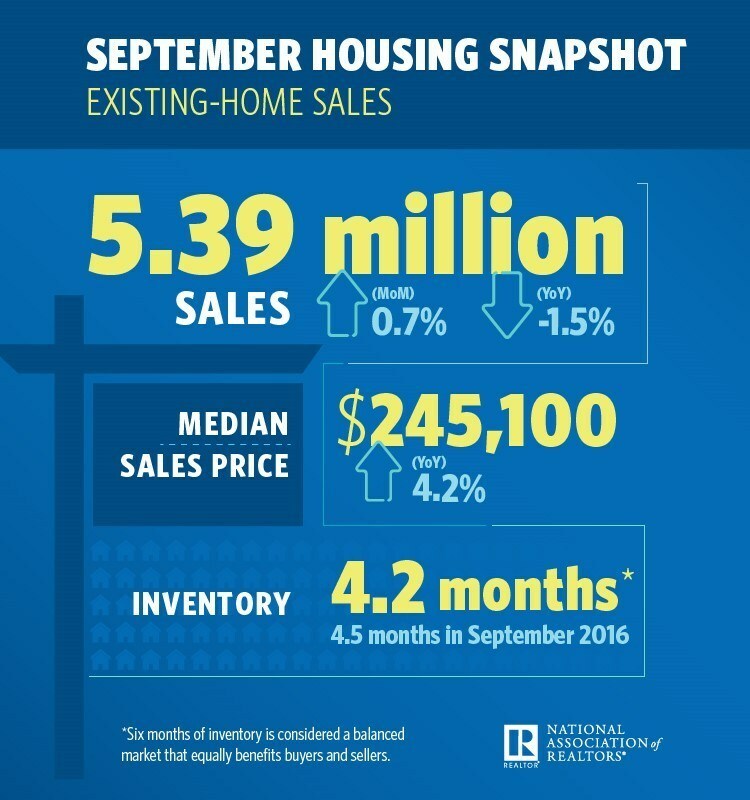 Existing-home sales slightly stirred in September, posting higher than in August but lower than one year prior, the National Association of REALTORS® (NAR) reports. Existing-home sales totaled 5.39 million, a 0.7 percent increase from August but a 1.5 percent decrease from one year prior. Inventory increased 1.6 percent to 1.90 million, 6.4 percent below one year prior. Inventory is currently at a 4.2-month supply. Existing homes averaged 34 days on market in September, five days less than one year prior. All told, 48 percent of homes sold in September were on the market for less than one month. The metropolitan areas with the fewest days on market in September, according to data from realtor.com, were San Francisco-Oakland-Hayward, Calif. (30 days); San Jose-Sunnyvale-Santa Clara, Calif. (32 days); Salt Lake City, Utah (35 days); and Seattle-Tacoma-Bellevue, Wash., and Vallejo-Fairfield, Calif. (both 36 days). The median existing-home price for all types of houses (single-family, condo, co-op and townhome) was $245,100, a 4.2 percent increase from one year prior. The median price for a single-family existing home was $246,800, while the median price for an existing condo was $231,300. “A continuation of last month’s alleviating price growth, which was the slowest since last December (4.5 percent), would improve affordability conditions and be good news for the would-be buyers who have been held back by higher prices this year,” Yun says. Single-family existing-home sales came in at 4.79 million in September, a 1.1 percent increase from 4.74 million in August, but a 1.2 percent decrease from 4.85 million one year prior. Existing-condo and -co-op sales came in at 600,000, a 1.6 percent decrease from August and a 3.2 percent decrease from one year prior. Twenty percent of existing-home sales in September were all-cash, with 15 percent by individual investors. Four percent were distressed. The Midwest and West saw positive activity in September, with existing-home sales rising 1.6 percent to 1.30 million in the Midwest, with a median price of $195,800, and 3.3 percent to 1.24 million in the West, with a median price of $362,700. Existing-home sales in the South fell, 0.9 percent to 2.13 million, with a median price of $215,100. Existing-home sales in the Northeast were unmoved at 720,000, with a median price of $274,100. “Home sales in the South continue to be hampered by post-hurricane weakness, while the Midwest and West regions show pretty strong pick-up in sales from August. It should be noted that the fires in California are not yet reflected in the data, so we’re likely to see more weakness on the horizon,” Hale says. “Sales activity likely would have been somewhat stronger if not for the fact that parts of Texas and South Florida—hit by Hurricanes Harvey and Irma—saw temporary, but notable declines,” says Yun. First-time homebuyers comprised 29 percent of existing-home sales in September, a decrease from 31 percent in August. “Nearly two-thirds of renters currently believe now is a good time to buy a home, but weakening affordability and few choices in their price range have made it really difficult for more aspiring first-time buyers to reach the market,” Yun says. NAR President Bill Brown is concerned first-time homebuyers, and homeowners in general, will be adversely impacted by proposed tax reform. If you are a city dweller who have moved out to the suburbs, or a rural area where you might have a septic system in your back yard, there are some things you need to know to keep it from becoming a nightmare expense. This article applies to regular, leach field type systems but there are some things common to any septic system. First, you don’t want to flush anything down the drain that you have not eaten or drank. Things like tampons or condoms never break down and can clog up your system to the point that they may have to dig up your whole back yard and replace the pipes. A septic system usually has two tanks, one that digests the waste and passes it on to a second tank that filters out more of the solids and allows them to settle before the liquid goes out into pipes in your yard to settle into the ground. If you use too many household cleaning products, such as chlorine bleach you could kill much of your good bacteria in the septic system that digest the waste. The same goes for excessive amounts of grease. This doesn’t mean that you can’t use cleaners, just use them sparingly. Products such as RidX contain the same kind of bacteria you system uses, in large concentrations. It is not a cure all, but will work to restore balance in your septic system if too many good bacteria have been killed by cleaners, etc. Also, if you have a garbage disposal, use it sparingly. Composting is a much better idea. And, don’t allow trees to grow anywhere near septic fields. Tree roots clog the flows of your important leach field. You may not know exactly where your field is, but is summer it is usually where the grass in your yard grows the greenest! Lastly, don’t build anything over this area. It is important for natural sunlight to fall the area to speed transpiration. If you notice standing water in the field area, call a professional immediately. Fixing the problem now will invariably be much cheaper than waiting, as septic problems never fix themselves, and generally get worse with time. Linda McKissack and her husband were $600,000 in debt when they made a real estate decision that turned their lives around. Today, the McKissack Realty Group sells over $60 million and over 300 properties each year. McKissack says their biggest success is not their property sales; it’s how they learned to generate over $250,000 a year in passive income and achieve financial freedom through real estate. Linda McKissack is an entrepreneur, REALTOR®, and the author of “HOLD: How to Find, Buy and Rent Houses for Wealth.” She’s also a trainer and speaker whose greatest passion is helping others achieve their maximum potential. She’s created five successful businesses and is an owner/investor in numerous residential and commercial properties. Using lessons from her book, McKissack explains how to start investing and earning money even when you have no money. McKissack’s husband shut down his Dallas nightclub, and four years later they were $600,000 in debt. He asked for her help digging out of debt, and said his mentor once told him the way to make a lot of money fast was in real estate. “I’m sure he meant invest in real estate, buy real estate,” McKissack said, “not put your wife to work selling real estate, but sell is what I did.” McKissack took a job in real estate sales, and Jim went to work in her office. They restructured their debt with a simple goal: getting back into the black. McKissack’s first real estate investment came in 1991. They had no cash, a lot of debt to pay off and weak credit, and the only real estate they owned was the house they lived in, which had a big mortgage. Not wanting to rely on others for their financial security is what started the couple down the road to financial freedom with HOLD. Buy property at 10 percent or more below market value. Put at least a 20 percent or more down payment on the property. Be at a 70 percent loan-to-value ratio or less so you’re not over-leveraged. Cash flow should be a minimum of $200 per month after PITI and management on a 15-year amortization. Buy a newer home (15 years or newer) if possible. Buy a 3-4-bedroom brick or stucco (if possible). Buy homes in stable or appreciating neighborhoods. Be an investor, not a speculator. It isn’t personal, and the numbers matter most. Don’t get attached to the house or people. Learn the magic of leverage. Cultivate relationships with other investors and people involved in real estate investing. Give to others and share your information, wealth, and knowledge. By purchasing 20 single family rental properties that each generated $1,000 cash flow per month, and completing those purchases in five years, with each property financed on a 15-year note with at least 20 percent down payment, the McKissacks were able to keep investing in additional properties. The HOLD strategy isn’t a get-rich-quick scheme, but a long, slow process that involves learning how to build and sustain a strong team and how to run your real estate career as a business, not a job. These and more tips and information on building passive income are in a recent webinar featuring McKissack. Learn more about the team-building cycle, including how to hire great people who can take you greater financial and business success, by listening to the entire webinar.